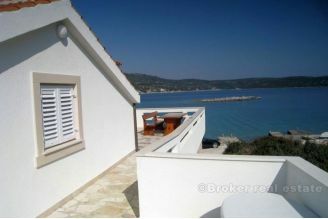 This villa is situated in an ideal location, right by the sea in the bay. It was built on a 411 m2 plot and is spread over 3 levels with 237 m2 of living space. On the ground floor there is an open living room with fireplace and direct access to the covered terrace with a beautiful view of the garden and bay. On this floor there is also a kitchen and bathroom with balcony. A staircase leads to the first floor where there are two bedrooms, and bathroom. On the second floor is a bedroom, open living room and a bathroom with shower and toilet. 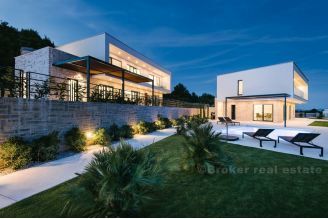 Pool, with its unusual shape and exceptional lighting system, this property certainly makes extremely attractive and unique. 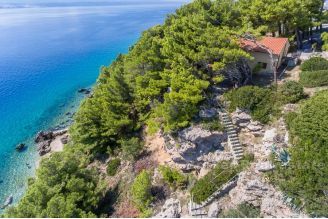 Additional equipment of the villa includes: underfloor heating, lighting control, LED lighting, alarm system, wi-fi, indoor and outdoor cameras controlled via the Internet. The villa is completely finished and ready for moving in. 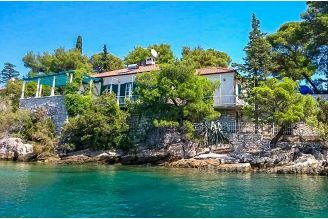 Distance from the center of Rogoznica is 10km, while airport of Split is 35 km away.